What is mycoplasma, and how does it affect your cell culture? Mycoplasma are the smallest free living organisms, and are considered to be the simplest parasitic bacteria. They have a size of less than 100nm, with simple genomes, and have simple lipoproteins instead of a solid outer cell wall. They are commonly known to contaminate cell cultures which can influence biological results. Fig 1. 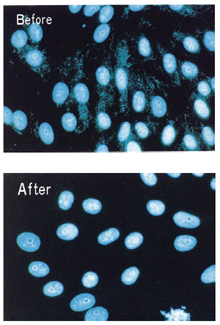 The effect of Mycoplasma Removal Agent (0.5 µg/ml) in the culture media of mycoplasma-infected cells after 1 week. Given the strong effects that mycoplasma cause within cell cultures, it is recommended as stated by the European Collection of Animal Cell Cultures (Porton Down, U.K.) that laboratories which routinely use cell culture should regularly test for mycoplasma contamination. However, it is difficult to test for contamination because some strains of mycoplasma do not grow in vitro and require DNA staining and PCR detection methods. You can detect mycoplasma infections though testing cultures on standardized agar, and identifying the typical “fried egg” morphology after 3-4 weeks. Therefore, through using a preventative antibiotic such as Mycoplasma Removal Agent (MRA), you can eliminate the chance that your cell culture will be affected, without the need for routine testing. MRA is very easy to use to treat contaminated cultures, simply requiring incubation for a week after addition to cell cultures. Mycoplasma Removal Agent is a broad spectrum antibiotic reagent containing a 4-oxoquinoline-3-carboxylic acid derivative which is highly effective at killing and removing mycoplasma from cell cultures. Mycoplasma Removal Agent is a derivative of the quinolone family of antibiotics, developed to combat the widespread problems caused by contamination of cell cultures with mycoplasma through inhibiting mycoplasma DNA gyrase. It shows strong anti-mycoplasma activity against many types of mycoplasma including Mycoplasma orale, M. arginini, M. hyorhinis and Acholeplasma laidlawii. It is commonly used in tissue culture, where it requires incubation for a week after adding to cell cultures contaminated by mycoplasma.